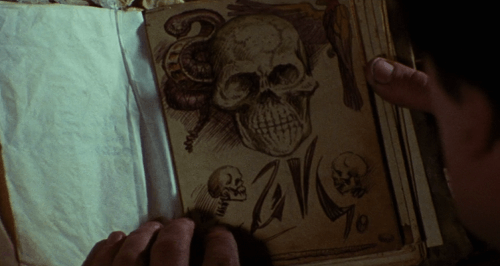 The world probably doesn’t need yet another shining critique of 1981’s Evil Dead. There’s already been plenty - both at the time of its original release, and plenty more over the years to give it a rightful place among horror's landmark horror gorefests. Its additional achievements since its initial relase to the world are just as well documented. It was the film that made Sam Raimi a name. It made Bruce Campbell (as well as Ash Williams, the character he plays) a cult film icon. It has given birth to two acclaimed sequels and a currently airing, equally successful TV series. Above all, it has continued to appall and delight audiences to this very day with its insistence on being both enduringly visionary,  and viscerally insane. Anyone who knows the name of this film has likely seen it, so they already know it’s awesome. With this said, the best I can do with this review is talk about why I personally loved it, even if it did take me until Halloween 2016 to sit down to watch it. Consider most of the time prior to that wasted - very few movies can still pack a chainsaw to the gut like this classic tale of supernatural slaughter does. The biggest and perhaps only crime that Raimi’s big break is responsible for is how long it takes for all of its genre-defining weirdness to lurch into full swing. Its setup - a bunch of college students vacationing to an abandoned lodge in the mountains unaware of the demonic force lying dormant around it - is about as repeated a plot device you’re likely to find in any horror from past or present. The cast seem to be aware of this lack of originality too if their early scenes are anything to go by. A brief blood-red on white opening credit sequence gives way to a pretty unenergetic series of initial dialogues as the characters rattle off token comments about both trip and lodge, and dutifully exposit on the relationships they all have with one another. By the time they stumble on the Necronomicon - an ancient book of the occult - along with a bunch of mysterious tape recordings in this decrepit abode’s basement, a good 25-30 minutes has already elapsed. Only then do we begin to get the scares and the gross-outs, as the group play the tapes and unwittingly unleash the incantations that raise the evil local spirits from their slumber. Compared to the modern day penchant for three-hour epics, a mere 25 minutes for necessary plot-building might seem quite paltry. But the lethargy in the acting makes it feel a lot longer here, especially when it’s the opening act to a movie that doesn’t even last an hour and a half. It’s even more frustrating when you already know from the film’s title alone that the Dead are gonna turn up anyway, and most of these kids, in true horror fashion, are going to wind up dying horribly regardless. But, in a perverse sense, perhaps the early trudge is intentional. Once the early labour is out of the way and the monsters can start to have their fun, The Evil Dead quickly and irreversibly transforms into a pummelling assault on the senses. 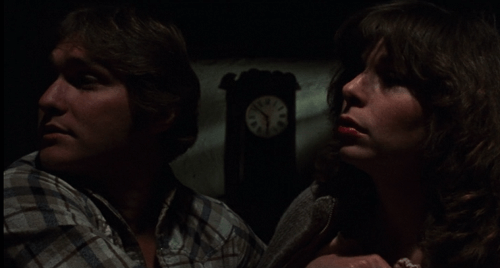 Even from the beginning, it loves to unsettle with its shaky, roaming camera shots scrambling around the landscape of its eventual bloodbath, and the skulking ambient noise (courtesy of a typically essential John Carpenter soundtrack) persistently there in the background to slowly tighten the atmosphere. It might start off dozy, but it constantly promises an eventual shift in tone. When that shift comes - by way of demonic possession, by way of forcing its protagonists into difficult choices in the face of death, and predominantly by way of impossible amounts of blood, pus and other relentless gore raining down on the hapless victims - the film is freed from its trappings. And then it can hammer home the story that it really wants to tell. The remaining events that transpire as the students one-by-one succumb to the invisible demons that proceed to bring vengeance upon them are, from a perspective of unpleasance, completely unforgettable. They’re also carried by the very thing that by time alone should have dated the movie - its special effects. 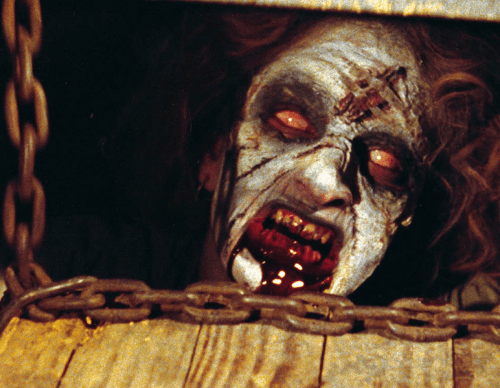 Despite so many advancements in this area of film-making, The Evil Dead’s influential approach to transforming its human cast into ghastly cadavers of the possessed is still timelessly unnerving. Given the meagre budget it was produced on, its shrewd use of prosthetics and other various visual enhancements (even claymation) then has its fear-inducing potential dialled up to 11 by some uniquely terrifying sound editing that make the film’s demented antagonists truly one of a kind. Even while they’re being hacked and bludgeoned to (re)death, these former students howl, scream, taunt and cackle unremittingly in a way that genuinely gets under the skin - and which many other horror films have failed to capture since. Such ingenious production isn’t used for shallow scares alone either. There’s something else about how maniacally grisly The Evil Dead’s victims-to-monsters become, compared to their pronouncedly mundane initial selves, that makes the movie work on a personal level too. The film’s ability to disturb is definitely helped by the fact that this group of ‘friends’ venturing out to the wilderness are closer than the regular horror-film lambs to the slaughter. With the cast of characters including two romantically-involved couples plus one brother-sister pairing, these deeper bonds make the revelation of the kill-or-be-killed situation they now find themselves in even more alarming - especially when the ones now trying to kill them are their former loved ones. Such a plot element has been done many, many times before - that can’t be argued. 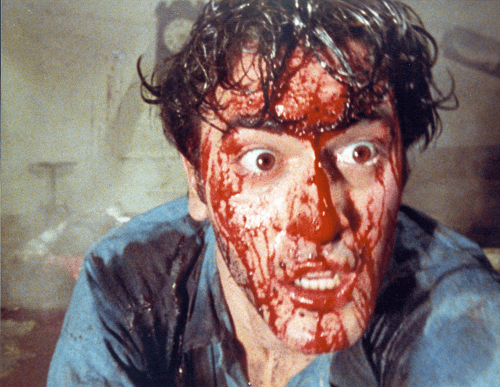 But rarely has it felt so raw and amplified as it does in The Evil Dead, particularly thanks to the jolting change the movie undergoes, and the blood and carnage that flows with it. Ash (Bruce Campbell), the film’s main protagonist and eventually the only one left to contend with the ghoulish abominations his friends have become, naturally reacts to this change on a deeper level than the viewer does. By the climax of the movie, he's wearing a far different face to the one he begins it with. From laid-back undergrad enjoying a break with some buddies, his slow transformation into a shotgun-wielding half-maniac clinging on to survival while teetering on the edge of full-blown terror is a gripping one. Bruce Campbell definitely deserves a text-based round of applause here for pulling off such a metamorphosis as well. It’s mostly through Ash that we witness the movie’s events, and it’s this convincing change - helped a bit by Raimi’s eye for some brilliant close shots, plus a symbolic message or two - that enables The Evil Dead to maintain itself as an engaging horror flick, instead of descending into a campy schlock piece. 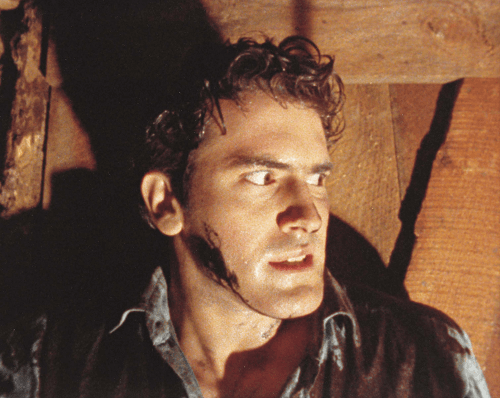 Campbell tows the thin wire his character pitches himself on so perfectly that it’s safe to say that without him as main lead, The Evil Dead just wouldn’t be the same film - even on grounds of sheer tension alone. But then without some tremendous ideas thrown in courtesy of Raimi’s direction, neither would it have succeeded. We can be very thankful that this duo’s friendship even came about - without the dramatics or the vision supplied by either, The Evil Dead at best would have come into the world as a B-movie long since forgotten, instead of the cult franchise it is now. Finally before we close this, no review of this movie would be complete without a mention of the gore involved. My goodness, there’s so much. Ash repeatedly gets drenched in deluges of blood n' guts for the simple reason of just because, and that’s merely the tip of the body-part iceberg that plays out. So intentionally aware is the movie of its own exaggerated need for dismemberment and cascades of bloodshed that it is just as much a celebration of dark humour simply due to how ridiculous it becomes. And yet the movie never feels ludicrous, or that any of its individual pieces are overdone. Its taste for extremity is merely the sum of all of its individual parts. Part undead horror, part psychological creeper, part stomach-turner and yes, even part comedy, The Evil Dead intentionally goes all out on every front. And best of all, it absolutely nails each one as well.